Thursday marks the official beginning of “Carnival”. It goes by many names in German, depending on the region and dialect. 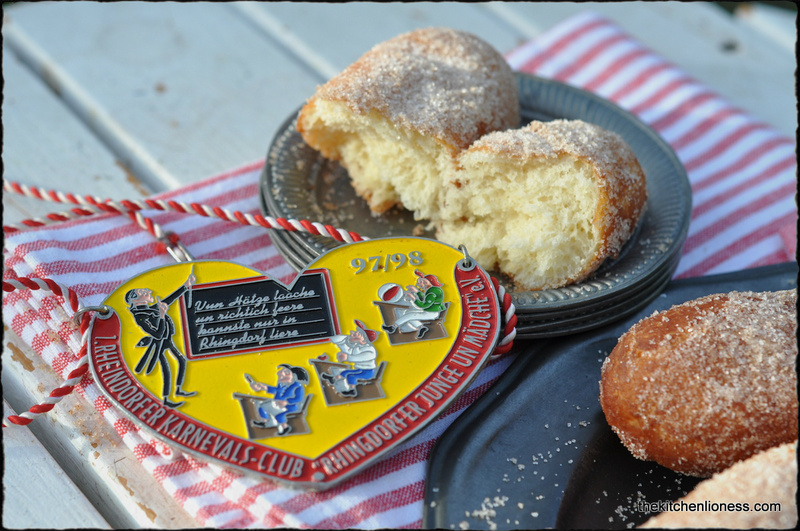 Whether you call it “Fastnacht”, “Fasching” or “Karneval”, it is a time for revelry, humor, and satire. 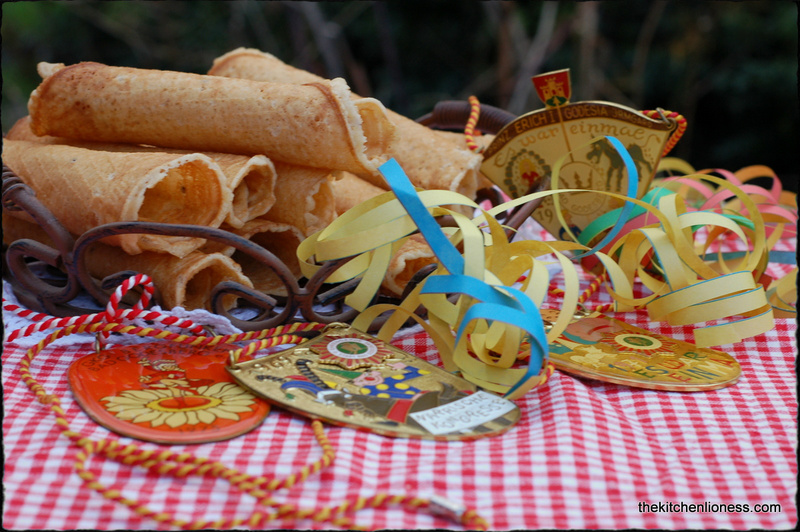 The actual celebrations of the German Carnival take place 40 days before Easter, it is like a last week-long party before Ash Wednesday (“Aschermittwoch”) and the beginning of Lent (“Fastenzeit”). Donnerstag markiert den offiziellen Beginn des Karnivals. Er hat viele Namen in Deutsch, je nach Region und Dialekt. Ob man es "Fastnacht", "Fasching" oder "Karneval" nennt, es ist in jedem Fall eine Zeit zum Feiern, des Humors und der Satire. Die eigentlichen Feierlichkeiten des deutschen Karnevals beginnen 40 Tage vor Ostern, es ist wie eine letzte lange Party vor Aschermittwoch und somit dem Beginn der Fastenzeit. On Thursday, the Carnival celebrations kick off with Women’s Carnival Day (“Weiberfastnacht”) at exactly 11.11 a.m. The next highlight is Rose Monday (“Rosenmontag”). Marching bands, dancers, and floats parade down city streets. The participants of the parades throw confetti, sweets, little bundles of flowers and toys to the eager costumed crowds lining the streets where the parades take place. The elaborate floats often show caricatured figures mocking politicians and other personalities and thousands of dressed-up Germans are flocking the streets every year to watch these spectacles. An Weiberfastnacht um 11:11 Uhr geht es dann endlich los. Und am Rosenmontag gibt es traditionelle Karnevalszüge in vielen deutschen Städten. Die Züge bestehen aus Abordnungen der Karnevalsvereine mit Prunkwagen, Kapellen, Tanzgruppierungen und oft auch aus so genannten Motivwagen. Letztere stellen oft Ereignisse und Personen des vergangenen Jahres in satirisch interpretierter Form dar. Von den Prunkwagen und den teilnehmenden Gruppen des Umzugs werden Kamelle und Blumen unter die Zuschauer geworfen. On Shrove Tuesday ("Veilchendienstag"), costume balls are held all over Germany, while the quiet Ash Wednesday ("Aschermittwoch") marks the end of the frenzied fun. Am Veilchendienstag finden viele Kostümbälle statt und am Aschermittwoch beginnt die 40-tägige Fastenzeit und somit steht dieser Tag für das Ende der Karnevalssaison. As with every longstanding traditional holiday, special sweet treats are also served during the Carnival season. 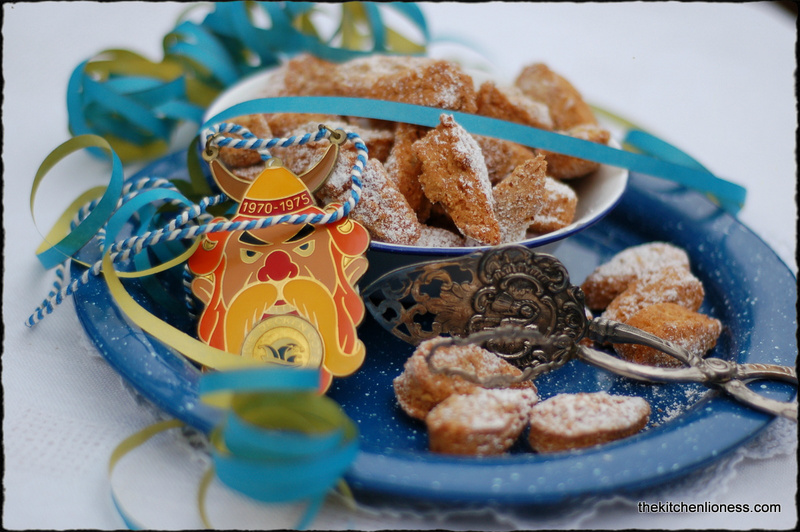 So during the next couple of days, the so-called "fifth season" ("fünfte Jahreszeit"), I will be baking some very tasty Carnival treats. Passend zur Saison gibt es natürlich jede Menge süße Karnevalsrezepte. Während der nächsten paar Tage, der so genannten "fünften Jahreszeit", werde ich einige wunderbare traditionellen Karnevals-Leckereien backen. ….oder Eiserkuchen, die in einem speziellen Waffeleisen gebacken werden. 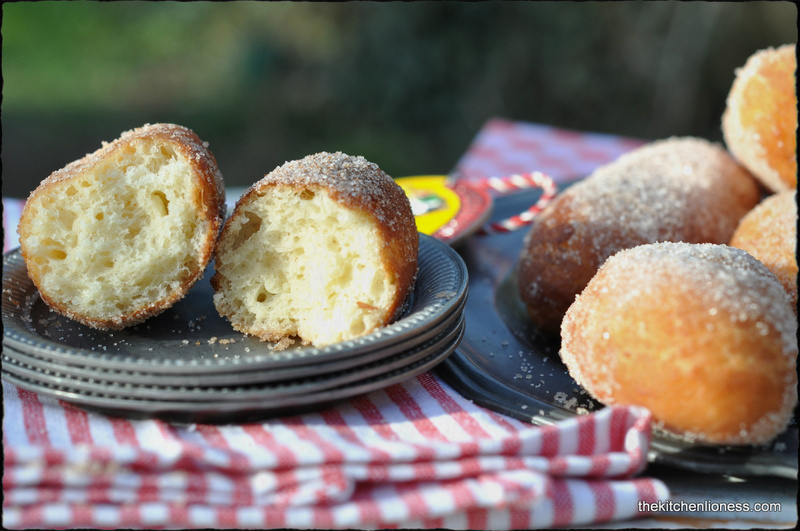 Mein Rezept ist angelehnt an das Rezept meiner Oma Clara - leider ist das Orginal verloren gegangen..
Today, I am featuring a recipe for traditional Quark Doughnut Strips. Heute beginne ich meine Karnevals-Bäckerei mit traditionellen Quarknudeln. Mix together the flour, fresh yeast, butter, sugar, vanilla sugar, Quark, salt, and eggs in a bowl. Add the milk and knead until you have a smooth dough. If the dough is too soft, add some flour. Cover the bowl and let the dough rise in a warm place for 30 minutes. *NOTES: pastry flour is available in the U.S. in health food stores, specialty stores, and online - to make flour with the same gluten content as pastry flour, combine 1 1/3 cups (185g) AP flour and 2/3 cup (90g) cake flour). ** Quark is also known as soft white cheese or fromage blanc. Divide the dough into 20 equal pieces, and shape each into a ball and then a kind of noodle. Place the dough strips on a lightly floured kitchen towel, cover and let the dough strips rest in a warm place for another thirty minutes. 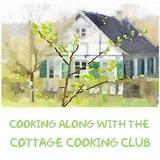 Heat the fat/oil for deep-frying to 175 degrees Celsius. Slide the dough strips into the hot fat making sure to leave sufficient space between the strips as they will expand during frying. Fry until they are golden brown. Drain the strips on paper towels. Roll the dough strips in cinnamon sugar while they are still warm. NOTE: As is the case with most fried treats, these are best enjoyed while still warm and are definitely best eaten the same day they are made. Mehl, Hefe, Butter, Zucker, Vanillezucker, Quark, Salz und Eier in eine Schüssel geben. Milch zufügen und zu einem glatten Teig verkneten. Falls der Teig zu weich ist, noch etwas Mehl zufügen und abgedeckt ca. 30 Minuten an einem warmen Ort gehen lassen. Den Teig in 20 gleich große Stücke teilen, jeweils zu einer Kugel und dann zu einer fingerdicken Nudel formen. Auf ein mit Mehl bestäubtes Küchentuch legen und abgedeckt ca. 30 Minuten an einem warmen Ort gehen lassen. Fett/Öl zum Frittieren auf 175 °C erhitzen. Die Quarknudeln vorsichtig in das heiße Fett gleiten lassen. Dabei darauf achten, dass ausreichend Platz zwischen den Nudeln bleibt. Mit 2 Esslöffeln wenden und backen, bis sie goldbraun sind. Noch warm in Zimt-Zucker wälzen. 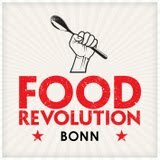 Hinweis: Wie mit dem meisten Gebäck, dass in Fett ausgebacken wird, schmecken auch diese Quarknudeln am besten noch warm und sollten auf jeden Fall noch am selben Tag genossen werden. Let the Carnival celebrations begin! Good advice, Andrea. Eat them while they are warm. I'll have no problems following this instruction. Hope you have a wonderful time during Carnival! Hester, the kids are having a ball at this time of year - mind you, wearing costumes all day long, having a few days off at school and eating a ton of sweet treats does help! I'd have trouble waiting for Carnival to enjoy these gems! And they must taste incredible!!! Liz, although these lovely sweet treats are considered to be traditional Carnival pastries, I am know to make them at other occasions - they are indeed delicious - thank you for the nice comment! Oh my! These sound wonderful. 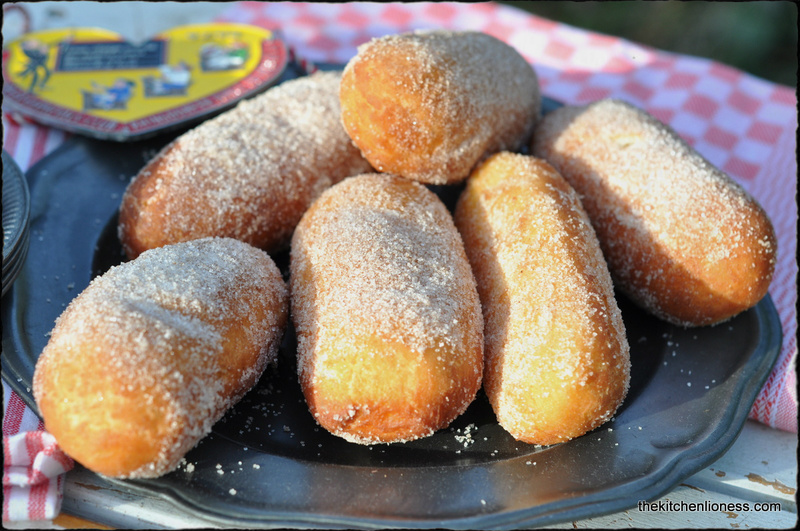 I just love fried dough - puffy little balls, rolled out, you name it, I adore it! I look forward to your "fry fest"! Adri, the Carnival season is such a wonderful excuse to be baking up a storm of fried, sweet treats that do please the palate. Thank you very much, Cheri - glad that you like these! They are very popular around here! Kim, thank you, my dear - actually it would be nice to share a few of these pastries. I am sure you would enjoy them - I have not met anyone around here yet who does not like them. These carnival pastries look lovely! they are so wonderfully presented as always… This reminds me of the Goan carnival (India) where I spent 4 years and loved it every single year… One week full of fun frolic and food! I just loved it….. There are indeeed Carnival celebrations held all over the world - people really enjoy celebrating for a few days, a time to have fun and some wonderful celebrations and eat great food! What a wonderful celebration...and what a delicious way to celebrate it! 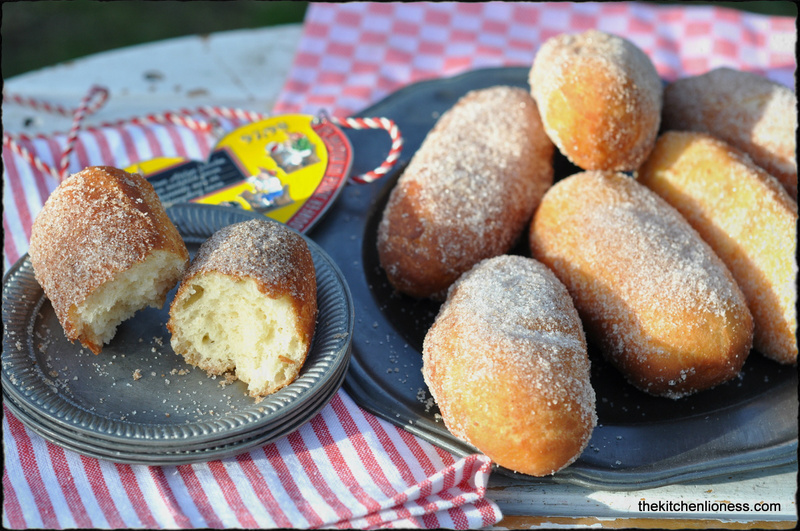 These doughnut strips look heavenly, Andrea! Thank you so much for sharing them! Monet, a fun time with great food - a lot of people look forward to these celebrations and the food that goes along with it all year! Carnival sounds a wonderful time of year full of amazing food, costumes and fun - your kids must be having the best time! Karen, Carnival is fabulous - a wonderful time for the kids but also for the adults - our kids are dressed up as cowgirls, cooks, clowns and hippies (alternating costumes every day for six days) - I am happily baking away. The weather is cooperating as well, there is sunshine - so time to go outside and celebrate street Carnival starting today! Dear David, I do know about Mardi Gras and I love those necklaces that peolple waer during the celebrations and the King Cake, of course - here it is a bit different and the kids are off from school - so time to celebrate a bit - the best part will be attending the parade on Rose Monday! Thank you for the kind comment, dear friend - how fun that you like my Carnival memorabilia, they get a place in the limelight only once a year! simply delicious, never heard any Quarknudeln, sounds irresistable!!! Dedy, thank you, these Carnival pastries are irresistable indeed! 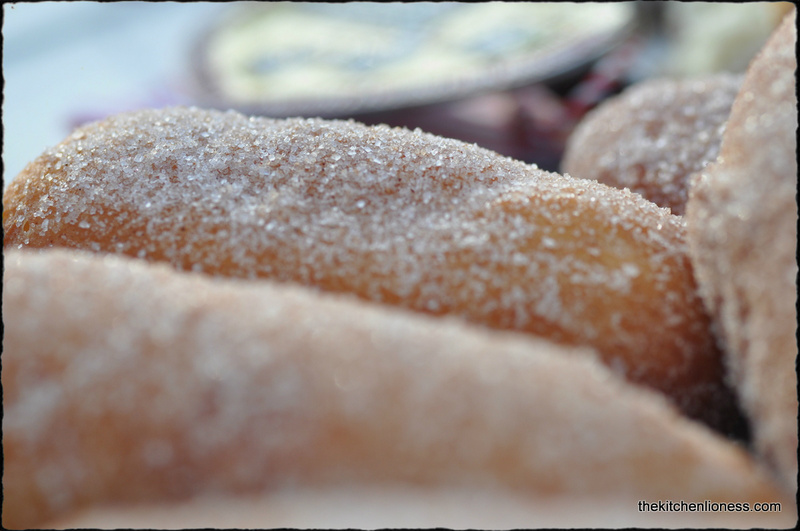 I am sure that you would enjoy them as well - who can resist fried sweet treats?! Liebe Wally, "KÖLLE ALAAF" indeed - als echte Kölsche feiere ich natürlich Karneval - jedenfalls ein wenig mit leckerem Essen und Gebäck und Kostümen und Besuch des Rosenmontagszug - Quark kann schwierig zu finden sein, ich habe das Gebäck noch nie mit griechischem Jogurt gebacken, ich hoffe, das Rezept wird dann genauso gut, denn diese Quarknudeln sind wirklich unglaublich lecker! Ganz liebe Grüße aus dem jecken Rheinland und Danke für den wunderbaren Kommentar! Dein Blog is the best!!! Liebe Wally, da bin ich aber froh, dass das Rezept mit Griechischem Jogurt geklappt hat - freut mich wirklich, dass dir das Rezept gefällt und die Quarknudeln gut angekommen sind. Und das dir mein Blog so gut gefällt macht mich wirklich glücklich und es bedeutet mir viel, dass du dir die Zeit nimmt für all die lieben Kommentare! Wie schön! Yay Carnival pastry!! I adore these kind of pastry every year! Now thanks to you I know how to make them by myself!! They look just fantastic!! Dear Amy, these are very easy to make and thankfully, Quark is easy to find in Switzerland - so if you do get a chance to make these pastries (Carnival or not), you will not regret it, I am sure! Andrea, I can't decide which pastry I like more! They all look amazing! I am a sucker for donuts so I'll say that I'm liking this recipe very much. So delicious! The carnival festivities sound so much fun too, I did not realise Germany celebrated in such a fun fashion. We have Mardi Gras here in some cities but I've never gone. It's a wild party! Nazneen, no need to decide which pastries to like best as they are all just wonderful - I make one batch every day of the Carnival season, so we get different ones every day - and yes some Germans are very much into the Carnival traditions and celebrating with costumes, parties, music, humor, and great food, especially those from the Rhineland (like myself). Thank you for the nice comment! What a festival of sweet treats Andrea...I love donuts but never made it at home...I like this doughnut strips especially with a coat of cinnamon and sugar...these would be perfect with a cup of coffee...beautiful pictures. Juliana, very kind of you - thank you. These doughnut strips are not only delicious but they have the added advantage of being baked, not fried - so one can easily indulge in one or two of these sweet treats. Why is that I believe these little delicacies were eaten warm and right out of the oven, just as your suggested. Did you have four young ladies helping you with the taste testing? I think these are two-bite pastries and then are gone. Right? Mary, "two/three bite pastries" indeed, depending on the size of the taste testers...they were devoured while still warm and just finished being rolled around in that cinnamon-sugar. The recipe makes about twenty of these, so not too many leftovers. Thank you for the fun comment!